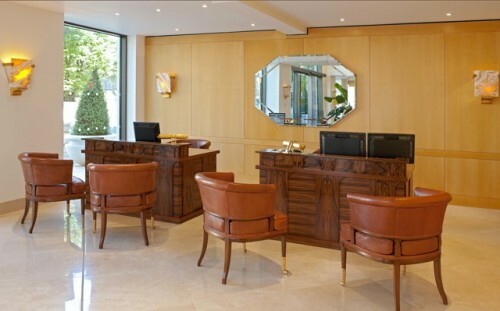 In addition to their spectacular regular collection, Soane also has an extensive range of furniture, lighting and upholstery designed and priced especially for hotels, restaurants, board rooms and other commercial spaces. Some of these pieces are adapted from iconic Soane designs and some are commissioned for specific projects. The contract pieces are different in that the designs have been very subtly tweeked to make them slightly more affordable for a commercial application. 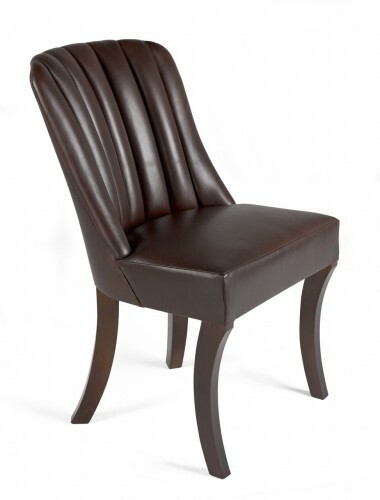 For example, instead of using a hand tanned goat skin leather for a chair, a more readily available leather might be used. Also, all contract orders must include a minimum of six pieces. 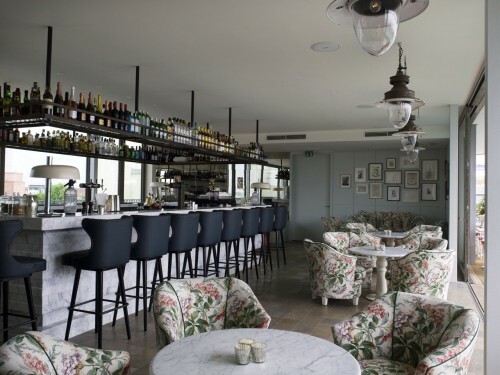 One of the more exciting recent projects was Soane’s work for Soho House in Berlin. Located in the city’s hot Mitte neighborhood, the private members’ club with 40 bedrooms opened in May in a Bauhaus building. 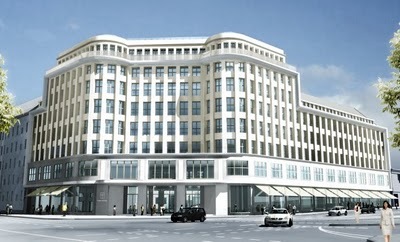 It was originally opened as a department store and then was used for years by the Communist party. Soane was commissioned to provide bespoke furniture and lighting for the attic bedrooms and suites and three different bar areas. This first shot shows the stylish custom barstools Soane designed for one of the bar areas. I love how they echo the shape of the chintz covered tub chairs yet look so much more modern. The second shot above shows an attic bedroom with the Contract Tricorn lamp (on left) and the Contract hand beaten mirror. 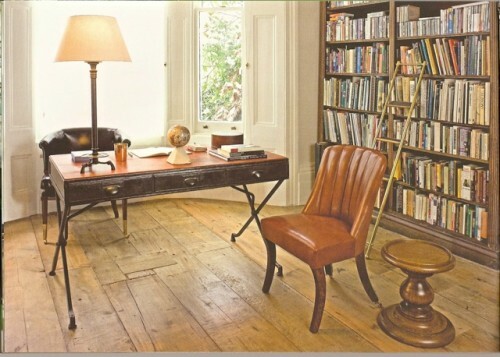 Both of these, as well as the bar stools are now available to purchase from Soane. Many other pieces were designed as well that now reside in the larger bedroom suites and two other bar areas. Another fun contract commission Soane received was to design the Bentley Boardroom at Mossimans Restaurant in London. 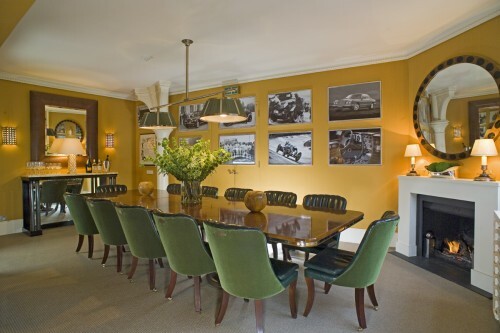 Everything in this room was designed by Soane including the beautiful green Contract Blower Chair, designed specifically for the project but now residing in the Soane collection. The handsome Yacht table is part of the regular Soane collection, as are the Cushion Leather Mirror, the Grisini Light, and the Oyster Veneer Mirror. The lights on the mantel and the fabulous green painted light over the dining table were designed particularly for Bentley. I guess if you were an executive at Bentley you’d expect to meet somewhere as elegant as this! I love the fabulous vintage Bentley photos on the wall! 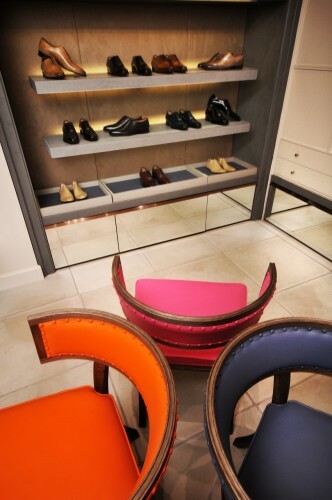 Lodger Footwear of London used these Contract Klismos Dining Chairs from the collection but gave them a whole other look by choosing their own leather. 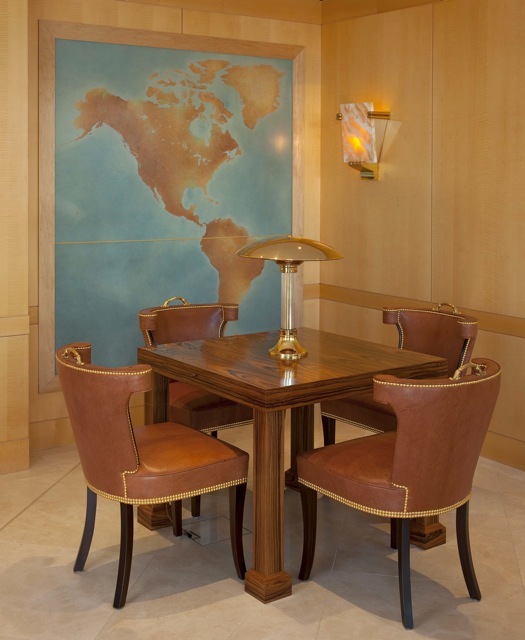 At the Embassy Court, a luxury apartment building in London, Soane designed the furniture and lighting for the public lobby. How would you like to be greeted by this elegant foyer every day? Featured are the Contract Quiver Klismos Chairs, Cartridge lights on the custom desks, Tiger Paw wall sconces and a mirror designed specifically for the project. This shot shows the seating area with the Contract Casino Chair, custom table and Contract Elliptical light. 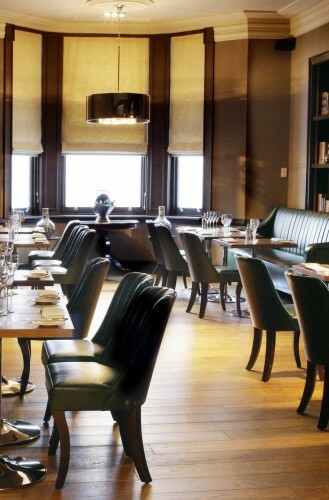 This classic Contract Blower Chair appears in a hotel restaurant in London. You can’t really see in the photo but they are a fabulous racing green. 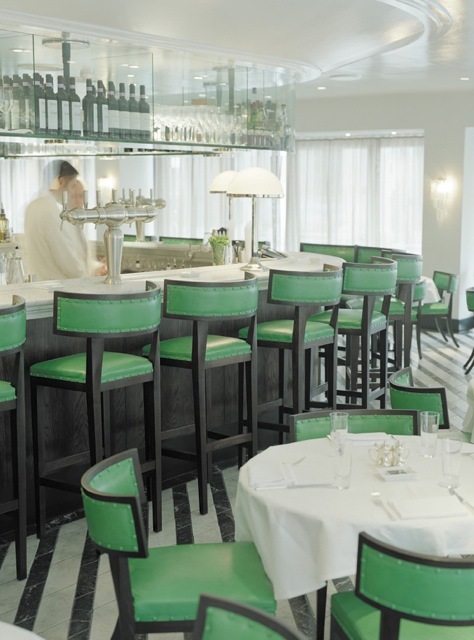 In Cecconis, a chic Italian restaurant in London, these Contract Klismos Chairs and bar stools were used to great effect. They really make the room!! And I adore these custom bar stools that were made for Shoreditch House in London, another private members club of the Soho House family. 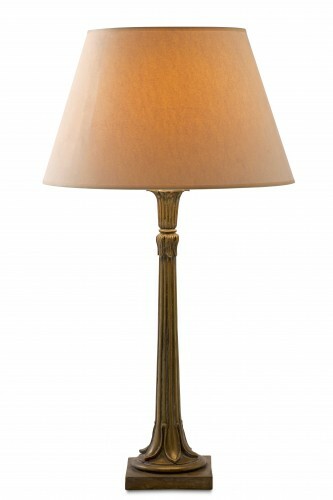 Soane made the lamps on the bar as well and I think the antiqued copper finish really makes the difference! There are many other products in the Contract Range as well, including these additional few. How fun is this Contract Owl Light, painted cream over brass! 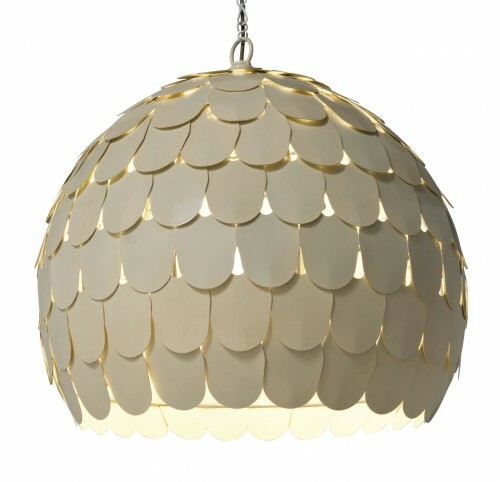 This elegant Contract Wilted Lotus Light is made out of resin as opposed to the metal version in the regular collection. And this classic Contract Astrolobe barstool could have a myriad of applications. There is still so much more to discuss about Soane. We haven’t even touched upon their new bath range. or the fact that they also accept and have completed bespoke commissions for private clients on their own and through their designers, such as this handsome private office in West London pictured below. I can only imagine being able to have them produce something just for me! If you are dying for something featured here, fear not, Soane ships regularly to the States but I’m keeping my fingers crossed that they decide someday that we are worthy of a showroom of our very own!! This entry posted in furniture, interior design, lighting. Entry Tags: Shoreditch House, Soane, Soane Contract Furniture, Soho House Berlin Bookmark the permalink. What an interesting blog you have here! 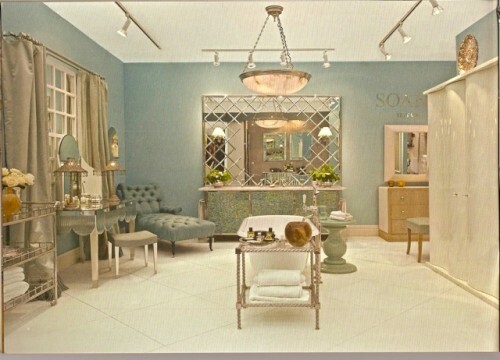 Loved learning about Soane, and I agree…they need to open up a showroom in the states…ASAP! Thank you for stopping by 24C…it’s nice to meet you! Hi Jessica – Thank you and nice to meet you as well – glad you appreciate Soane too! Stop by any time. Hi Diana – Happy Tuesday to you too! Soane produces so many amazing things – and this is just the tip of the iceberg! I really enjoy how informative your blog is – not just another pretty face! So now, I’m trying to figure out how I can add a counter in my kitchen so I can have one (well, actually two or three) of their spectacular bar stools. How can I decide? Do you do consulting? Elle – thank you! I do try. 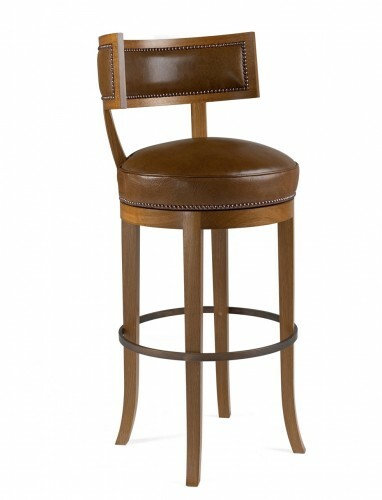 Don’t you just love those bar stools – they are my dream if I ever have a kitchen counter again. Consulting? Never thought about that – hmmmm. There is nothing quite like Soane: the best seating ever, beautiful old world quality and enough regency-style touched with modern to make everyone’s heart just a little happier. Please, show me more. Hi Mary – So glad to see another Soane fan. You described it perfectly! Today is the last day of Soane – for now! I want these for my dining room table! Oh wow! Such beautiful pieces of art! Thanks for the wonderful read on Soane! Hi Lourdes – You’re very welcome. Thanks for stopping by! fantastic post–love the barstools in green-so chic and who wouldn’t love to sit a martini in those poppy colored klismos chairs! HH – you read my mind!! 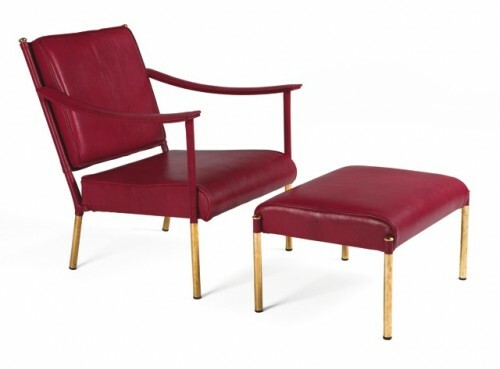 Wow I adore the red leather chair and ottoman!! Great company. Come and Enter my $200 giveaway from Fifi Flowers! Hi Karena – Isn’t it gorgeous?! It’s one of their most iconic pieces. I’ll stop by soon! Hi Connie – And there’s so much more!! I was very interested to learn about and read of Soane. I greatly admire the old, traditional crafts of Britain. It is good to know that these artisans and craftspeople are maintaining skills that have been passed down for generations. As an increasing number of our special skills are lost and manufacturing shifts to Asia, such workshops become treasures and they are in fact living history. I am also reminded of the great Staffordshire ceramics companies which have closed in the last 2 decades, after 2 or more centuries. Interesting article. Thank you. Dear Square with Flair – I so appreciate your perceptive comment. It is indeed living history and I admire Soane for supporting these artistic industries that are threatened by more commercial manufacturing. 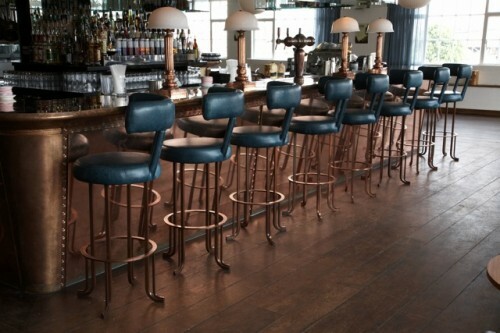 Absolutely loving every image of the bar stools and the spaces they are placed in…gorgeous work! Hi Hamptontoes – Don’t you love the stools?! Makes you wish you had a bar at home! 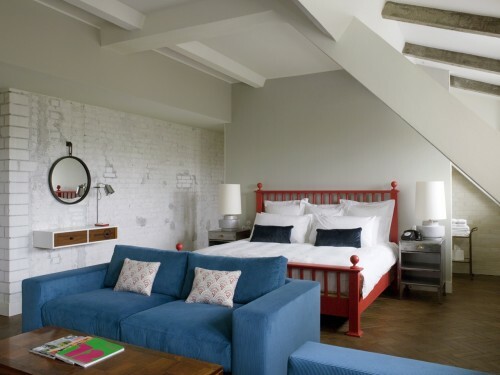 Oh, that delicious photo of Shoreditch House makes me want to hightail in back to London. The green is just beautiful. Thanks so much for stopping by today, so much fun to see your comments! I know – I’d like to belong to that club!! Hi Ann – All their chairs are beautiful – I think it just might be their strong suit! 83 queries in 0.602 seconds.